Jeff Griffin, a mechanic, and his wife, Sarah, travel from Montana to Manhattan to give their nine-year-old son, Cole, his dream vacation as they secretly face the heart-wrenching turmoil that has them teetering on divorce. While sightseeing near Times Square, Jeff steps into a store to buy batteries for their camera--but upon returning to the street he finds that Sarah and Cole have vanished. Battling his anguish and police suspicions, Jeff fights to rescue Sarah and Cole. He knows now that the love he and Sarah have is worth saving. But he could lose the chance to tell her amid growing fears that they have become entangled in an unfolding plot that could have global consequences. 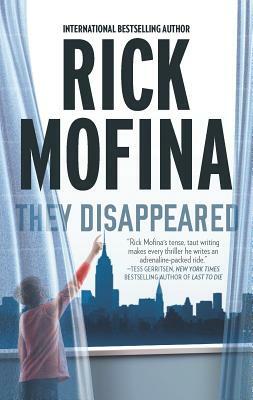 Rick Mofina is a former crime reporter and the award-winning author of several acclaimed thrillers. He's interviewed murderers face-to-face on death row; patrolled with the LAPD and the RCMP. His true crime articles have appeared in The New York Times, Marie Claire, Reader s Digest and Penthouse. He's reported from the U.S., Canada, the Caribbean, Africa, Qatar and Kuwait's border with Iraq. For more information pleasevisit www.rickmofina.com"
"A gripping no-holds-barred mystery...lightning paced...with enough twists to keep you turning pages well into the wee hours. Vengeance Road is masterful suspense."